Annette originally added an entry to the Memories Book. I extracted her text, then added the illustrations and comments. I was five years old and we lived in Ashley Avenue, in the Lower Weston area of Bath. I know I was very young at the time of the Blitz. Of course we were all used to the sirens, it was a daily occurrence. The first night when the bombing started we went into the coal cellar under the front steps. There was my Grandmother, my Aunt and her two month old baby, and Miss Palmer, who had a room at the top of the house. My Grandfather, my Mother and my Aunt were outside, I guess you called them Home Guards. It was very dark. The adults were very tense. Each time they heard a bomb falling there was crying and praying, and then the sighs of relief. Sometimes the bombs were very close. The houses on the opposite side of the street were totally destroyed and the people who lived there, eight of them I believe, were all killed. Our house was hit several times, the roof was blown off, and there was a lot of smoke and fire. The smell of burning rubber was very strong. We were told that a motorbike in our neighbours yard was burning. All of a sudden there was a big commotion outside. It was my Grandmother's family from Ashley Terrace. Their house had been hit, so we were joined my Great-Grandmother, my Aunt and three cousins and their dog. It was really crowded. The next morning my Grandfather took me with to examine the damage. There was lots of soot, and broken windows. There were some strange things, that he pointed out to me. The bathroom window was blown out from the wall, sitting in the bath tub, the window pane unbroken. In the front room a vase was sitting on the window ledge still full of water, but the violets that had been in the vase were strewn all over the room. Then we went to the attic. There was no roof. That was a scary place. I held Grandpa's hand tight. It was a strange world we saw. The huge crater across the street, and a tree in the middle of the road that had been uprooted and bent into an arch. That day we went to stay with some relatives who lived in the country near Combe Down. I think back and wonder what it was like for them to see all of us arriving. There must have been almost 20 of us. That night when the sirens started, everyone left the house and went to the old stone quarry. There was a full moon, and the country lane was like a tunnel, because of the hedges on either side. There were some very low flying planes. I could see the fire from the guns as they fired on us running down the road. When we arrived at the quarry there were people already there, huddled together. Some had candles. I remember the sound of people shovelling rubbish, moving it back from the mouth of the quarry to make room for the people. There was a horrible sour smell there. I believe we stayed at Combe Down three nights, returning to the quarry one more time. Passing through Bath on our return home we saw the devastation: bombed buildings, reminding me of a doll's house with the side lifted off and the furnishings falling out. These are memories that are so vivid and chilling. I still hate the sound of sirens, low flying planes, the smell of burning. In 1989 when we had a severe earthquake in California, when I saw the destruction in a local grocery store, it all came back, and I started to shiver and cry. It all came flooding back. I have many childhood memories of those war years. Our neighbour took in young refugees from other areas, and one girl in particular stands out. I never really met her. Our bedrooms were on the same floor. She was a young teenager and had been severely burned in a bombing, her face and hands were covered with bandages. We held mirrors out the window and talked to each other. She had no idea where her parents were. One day she was gone. Annette now lives in America, hence her reference to an earthquake in California. The houses "on the opposite side of the street" that were totally destroyed were numbers 9, 10, 11 and 12. It was a 500Kg bomb that did the damage. These houses were rebuilt after the war. The picture used to illustrate Annette's story shows damage in the Lower Weston area. It does not show Annette's house, nor that of her Grandmother, but both would have been very similar to these buildings. Notice that this bomb did not fall on the houses, and the bomb crater is in the foreground. 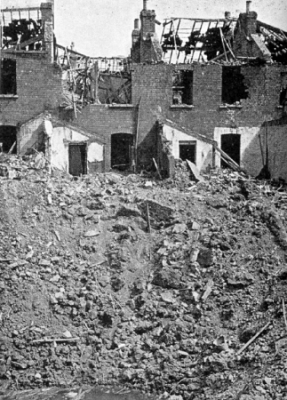 The houses would have been damaged by the blast, but most of the damage is to the upper floor and roof because the bomb penetrated the earth before exploding, and this has given some protection to the ground floor.